Two of the pontoon bridges used at the battle of Fredericksburg in December, 1862, are shown in this sketch. On the 11th and 12th of that month, the left wing of the army, under the command of Gen. Franklin, and composed of the First and Sixth Corps, crossed at this point, one and a half miles below the city, and went into position on the flats in front; the First Corps on the extreme left, with its right extending towards the hills, and the Sixth Corps nearly at right angles to the former, with its right reaching to the outskirts of Fredericksburg. The remainder of the army was formed through the city, extending about one mile above the town, and assaulted the heights. On the 13th the engagement opened on the field represented here, by Gen. Meade’s division, which carried the enemy’s position to a certain extent. Gen. Gibbon’s division was pushed in on Meade’s right to support him, and Gen. Doubleday’s division on the left with the same purpose, but a strong demonstration made on that portion of the line by the enemy with artillery and cavalry, rendered it necessary to throw the whole of Doubleday’s command against them. Meade held his position in the woods for some time, but not receiving additional support, was forced by a fierce attack in front to retire. Our forces having been driven from the woods, and it being late in the day, no other attack was made on this portion of the line, the troops remaining in entrenchments hastily thrown up across the plain, until recalled to this side of the river on the night of the 15th. There were seventeen thousand men engaged at this point, with thirty-eight thousand supporting them, but who were not brought into action in consequence of a misinterpretation of the orders of Gen. Burnside, commanding the army. Gen. Bayard, of the Cavalry, was killed by a shell in the edge of the little grove represented in the sketch. 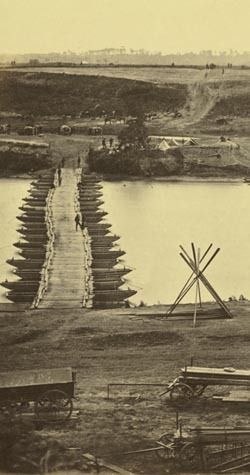 Pontoons were again laid at this point in June, 1863, and a body of troops thrown across the river to ascertain the movements of the enemy, who was found to have abandoned Fredericksburg, and to be marching towards the Blue Ridge, for the purpose of invading Pennsylvania.